I have been remiss in my diary and my treescapes are all out of order. I started 100 at Hoyt Arboretum after making sketches for 99 at E.E. Wilson Wildlife Refuge but then I finished 100 and as soon as it was finished, it became 99 which makes what was 99 now 100, sigh. I know, it’s a small thing, really. I have been besieged by fatigue and while it is possible to paint fatigued it has taken so much effort to do my day job and feed myself that the sketches from E.E. Wilson sat for three and a half weeks before I even looked at them. And while it is possible to paint fatigued it is a sort of internal slapstick the way chess is a sort of sport. My normal battle with a short attention span was all but lost at Hoyt, attempting to paint en plein air for the first time since winter. It is odd to feel a resentment toward branches for their complexity when their beauty is the whole reason I am out there in the first place. 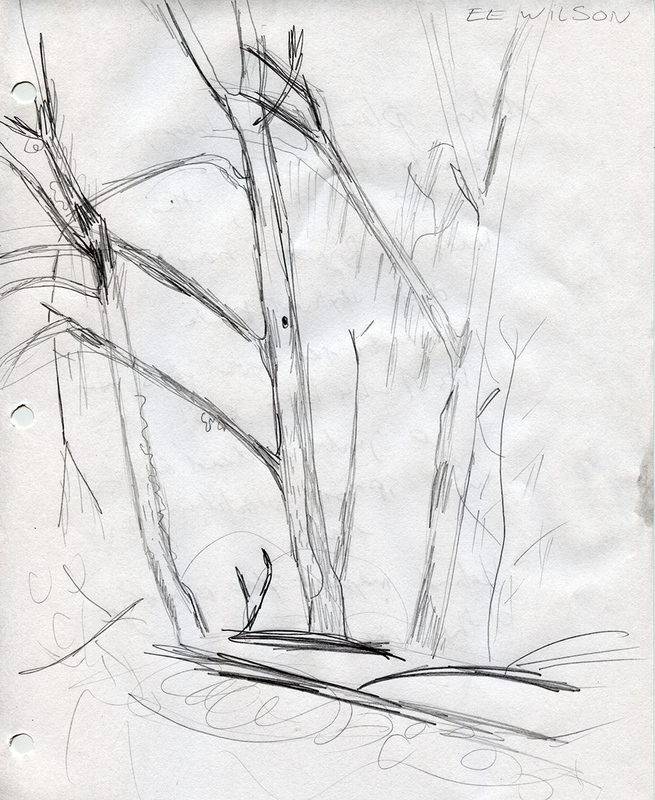 Do I really have to add in the foreshortened branch, those are so hard! I don’t know if I’ve painted this one already, they’re so crowded. 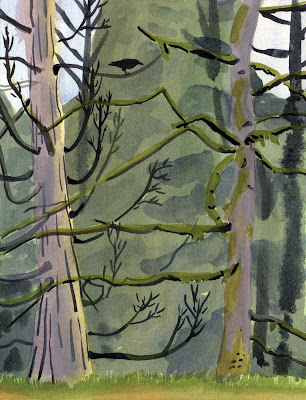 These long larch branches look awkward on paper. 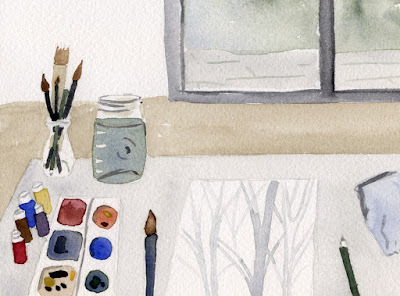 You’re kind of ruining this painting, long-awkward branch…no, really, it’s not me, it’s you. It is as absurd as it sounds, the root issue could be impatience. But also, I like to work symbolically, to illustrate. Painting does not think, it observes and records at varying levels of realism or abstraction. I find it very uncomfortable to climb into the part of my brain that can work on direct observation. When I do the resulting paintings have a sense of breath that is so compelling, I’d like to think I could become that kind of painter full-time if I worked at it. But I’m drawn instead to tell the story of a place—to illustrate the moment of three trees growing together like old friends in a shroud of lichen on an island of unruly foliage in the middle of a meadow that was just like walking into a fairy-tale bog. Having pursued an academic training in art I decided to make 100 paintings of trees and their surrounds from observation to develop my facility from which to tell stories. I lapse often into illustrating but have always maintained an uncomfortable effort to use more direct observation than I would normally be inclined to and now I am almost done with the project. I finished the awkward larch and dawn redwood from Hoyt Arboretum in my studio with the help of a sketch and a photo. Now number 100 sits on my table as a silvery line drawing, fine as lace and waiting for paint.